There are also some situations where it can be handy to preview advanced camera support Assets. We will briefly review some different scenarios that might be useful on the film set. Quick Look lets you browse files — photos, Pages documents, Keynote presentations, QuickTime movies, Microsoft Word and Excel files — without having to launch an application or leave Silverstack. Assets that are fully supported in Silverstack are playable via the regular playback function in the Playback view, in addition to the Quick Look feature. You can access the Quick Look feature from by going to the Main Menu: “Playback > Preview in QuickLook”. To improve your workflow you can also use the keyboard shortcut command “Alt + Cmd + L”. The Quick Look feature helps you to review an Asset without changing into the Playback view. This could be especially useful when you are reviewing shots in a camera roll with the director but still want to give him a glimpse overview (via thumbnails in the collection view) of the camera roll of the entire shooting today. Or if you would like to review the take with recorded scratch sound from the camera. If the recorded scene includes audio it will automatically playback with the Quick Look feature. 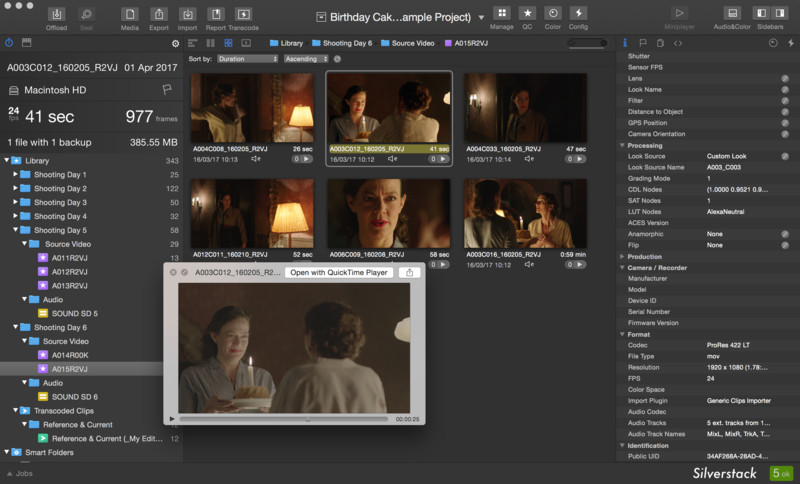 With the use of 3rd party software it is possible to preview footage and Assets that are not natively supported by Silverstack neither with MacOSX. These can be for example formats like XDCAM HD with help of tool mxf4Mac Import plugin and Final Cut Pro. Also some other 3rd plugins are out there. Please review this article to have a list of possible 3rd plugins. 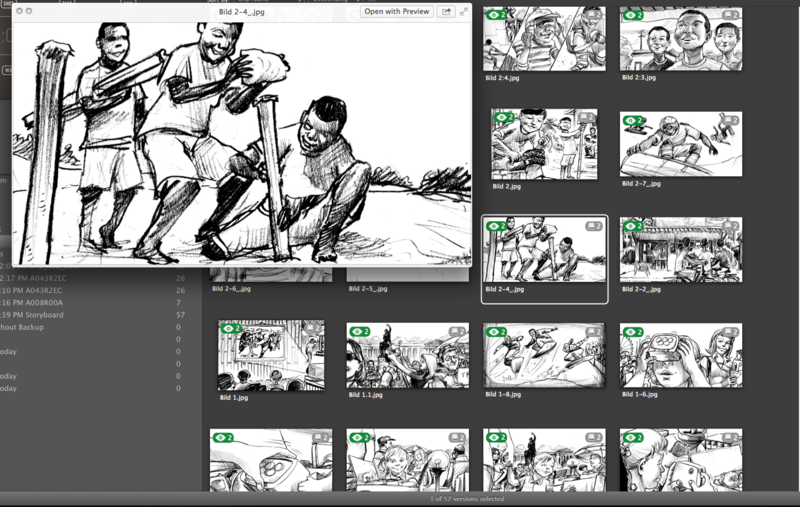 You can also give the director or the camera man the ability to review storyboards (like in figure 4.) or listen to some audio files that you offloaded from the sound department. With the Quick Look option you can also quickly watch a selection of takes from your camera roll. This is useful when you have many takes in one roll. You are still able to stay within your current view like in figure 3 but you are able to watch multiple clips and discuss those with the script continuity, the director or camera man and simple change clips with back and forward arrow within the Quick Look window. To make a non consecutively selection in the Collection-View (like in figure 3)you simple need to press the command key. If you like to make consecutive selection you simple press the Shift key. These simple command also applies for the Table-View.